In Hear This, A.V. Club writers sing the praises of songs they know well. This week, we’re featuring our favorite songs that only appeared on soundtracks. The unlikely duo of Mike Myers and Madonna has been an ideal match ever since Madonna’s unabashed pitch for her 1991 movie on Saturday Night Live, when she invited Wayne Campbell to play Truth Or Dare. She also guested as Linda Richman’s pal Liz Rosenberg on her program “Coffee Talk” when Barbra Streisand showed up. The creative partnership works because Madonna, though serious, always seems game, and Myers, though frequently goofy, is also creatively inventive. 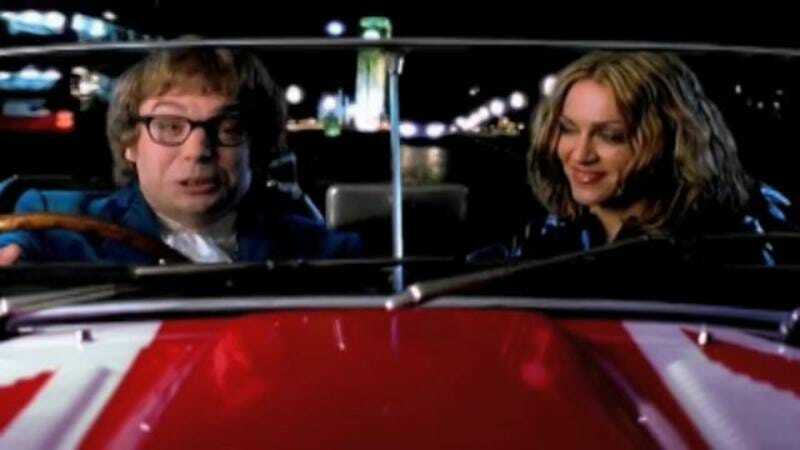 So Madonna was an obvious yet inspired choice to kick off the soundtrack for Myers’ 1999 Austin Powers sequel, The Spy Who Shagged Me. The collaboration resulted in “Beautiful Stranger,” Madonna’s best song that never appeared on a regular Madonna album. Building off her electronica dance reinvention from 1998’s Grammy-winning Ray Of Light, “Beautiful Stranger” was less ethereal, but just as dance-floor ready. She co-wrote the song with William Orbit (her Ray Of Light collaborator), achieving a psychedelic pop confection that offered a few of her most indelible hooks. The song managed to bridge Madonna’s silky dance pop with the ’60s period piece Myers was aiming for; dance flute has never sounded so enticing, and Madonna’s voice so sweetly seductive. And its hypnotic appeal was a natural background for a song about infatuation with someone you haven’t even met. For a potential one-off, “Beautiful Stranger” wound up with quite a storied history: It won the singer a Grammy for “Best Song Written For A Motion Picture, Television Or Other Visual Media.” Madonna realized the song’s strength as well, and eventually included it in two of her greatest-hits collections. It also added momentum to Madonna’s comeback for the then-looming 21st century: She used it as the fourth song in her set on her 2001 Drowned World Tour.